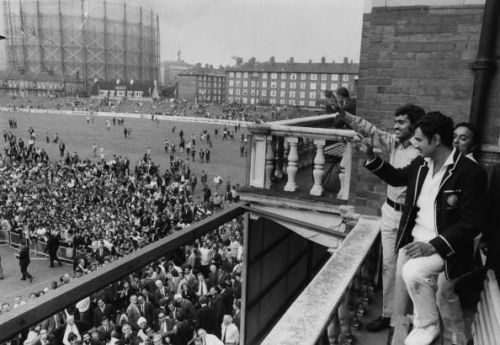 It will be unfair to not mention B.S Chandrasekhar's heroics and Sunil Gavaskar's masterful batting on their respective tours to England and West Indies in the summer of 1971 at the famous Ovals (Kennington and Kensington Oval). But it will also be highly unfair to not mention the Captain Ajit Wadekar in the same breath in those wins. A major portion of his contributions go fairly unnoticed due to the presence of some stalwarts in the squad, but his sheer genius is equal to the worth its weight in gold. His innings of 45 runs at The Oval in a stiff 4th innings chase in seaming and swinging conditions in England will go down as one of the most tenacious knocks ever played by an Indian. It is not so much for the runs required which was 173 runs to be exact, but that knock gave meaning to the Indians who in those times were considered minnows in the cricketing world. Back then, the team was criticized for not having the skills or technique to play in those conditions. But all this started and was made possible by the tactically adept Ajit Wadekar. During the time of war in 1971, India was engulfed in the fires that burned from the ashes of her sons. One of those sons with a bunch of a few good men went on a voyage to defeat and set the record straight, uncharacteristic of its nature but with fire in their bellies and a dream that was to be respected and to be a deserving one at that. Even though, the series of England and West Indies turned out not to be of personal satisfaction, but it rejuvenated and gave hope to the team that it so long desired and longed for. He also gave India and its cricket team some of the sport's most cherished players, the players whose name will be forever entwined with the destiny and history of the Indian cricket team. It also sparked a revolution among the Indian cricket fanatics who were to witness probably there most competitive and tenacious team assembled which were to receive its attainment in 1983 World Cup. The journey from being trained under the famous Mumbai batsmanship lineage to a chief selector and then the Indian cricket team coach, one should not forget the contribution of the man who gave the team its legs to run and the spirit to contend, eventually overcome the nasty but a fruitful road to the victories to come. The current Indian Test set up in England should take inspiration from these glories of the past. They should not bother about the missed opportunities anymore. These heartbreaking losses are bound to come. The superstars of today should bask in the glory of a turbulent yet celebrated history of Indian cricket and its overseas triumphs which started with a few determined men and a fearless captain at its helm.